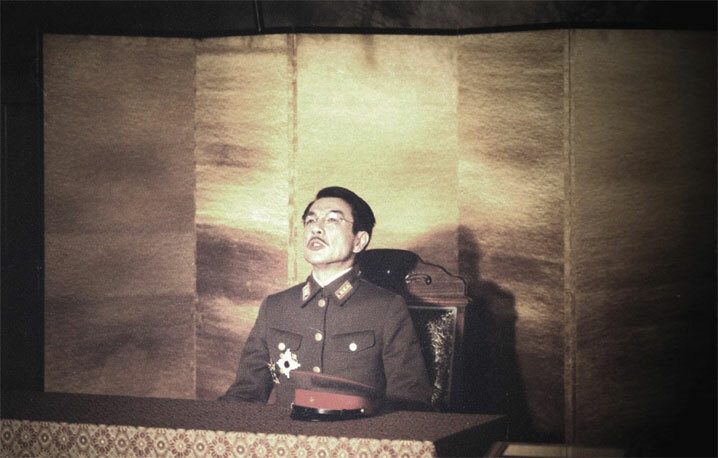 Aleksandr Sokurov’s series of films on the effects of power on historical persons continues with Japan’s Emperor Hirohito. This article was originally published as coverage of the New York Film Festival in 2005, but is being re-posted due to The Sun finally achieving a theatrical release in the U.S.
Issei Ogata as Emperor Hirohito, in a tremendous, devastating performance, is the center, heart, and soul of Aleksandr Sokurov’s chamber film about the Japanese figurehead at the end of World War 2, The Sun. Secluded—or sequestered—in the wood paneled apartments and concrete bunkers of the Imperial Palace, and waited on with a minute attention to detail and formality by two attendants, the Emperor exists in a realm of inactive, mitigated reverence. The conflict between Hirohito’s existence for the Japanese—and for himself—as a divine god and Hirohito as a humble human (“we have the same body” he says to his chamberlain) is visible in every moment of Ogata’s emphatic performance. Reserved to a remarkable degree for such an important person in the ideology of Japanese fascism, Ogata’s most expressive trait he brings to Hirohito is by having him constantly mouthing soundless words —a discreet but ingenious way to indicate the restrained personal, as well as public, pressures welled-up inside this petite, bespectacled, demure man. It also serves, along with an extraordinary later scene where the Emperor seems to daydream impressions of a firebombing, as a quasi-mystic channeling of the distant plight of the people (the “Emperor’s children”) through Hirohito’s godhead (“one hundred million hearts beating as one”). This crisis between the spiritual reserve, dignity, and passivity of the god, and his human aspects, which first show themselves in the awkwardness of the formality of the Emperor’s lifestyle and later appear more organically when General MacArthur’s intrusion in his life disturbs his reverential treatment, is the primary focus of The Sun. Using his unique form of cinematic chamber-psychology, Sukoruv has made an incisive look at the difficult question of Japan’s leadership responsibility, not through political drama but through a subtle and nuanced evocation of the inner spiritual, moral, and identity confusion of a single human. Sokurov and his screenwriter Yuri Arabov (who also wrote Taurus about Lenin and co-wrote Molokh, about Hitler, for Sokurov, which with this film form a trilogy about the burdens of political power) elide most of the climatic events of the war in favor of a dulled and muted mise-en-scène that purposely fails to communicate both what is happening in the outside world, as well as the representational importance of Hirohito’s life (here unrealistically restricted mostly to the interaction with the chamberlain, an attendant, and MacArthur). We see, for example, the U.S. army’s photographing of the Emperor but not the famous session with MacArthur, and similarly we hear about the calamitous speech Hirohito recorded that announced the end of the war and renounced his divine status, but we do not see him write or record the speech, and the only reference to the attempt of radicals in the military to seize the recording is cut out in favor of a devastatingly smaller-scale remark that the sound engineer who recorded the speech killed himself. Gradually one sees that the filmmakers have homed in on small details in the immediate postwar period that elucidate Hirohito’s ambiguous identity: though the photo with MacArthur had its part in demystifying the Emperor, the scene where American photographers show disbelief that the small Japanese man is the Emperor of Japan and their comparison of Hirohito with Charlie Chaplin emblemizes The Sun’s use of historically innocuous moments provoking profound personal insight. Still, keeping out famous events makes it nearly impossible to determine when The Sun takes place. Towards the beginning, Hirohito meets with an embarrassed, confounded cabinet about the state of the war, and after hearing about the collapsing front and a seemingly random remark about how dogs strapped with bombs are raising the men’s morale, the Emperor recites a poem, and like a school teacher lectures the cabinet on its allusions to keeping Japan at peace with the world. But later that day the attendant interrupts the Emperor’s writing time, and the Emperor, surprised, asks “The Americans?”—and so then the war is over, the American Army is literally on the palace grounds and the Emperor meets with MacArthur (Robert Dawson), who himself is confounded at how to treat Hirohito, questioning him both as a national leader and a human being. With his world of reserved, awed adjuncts receding in the face of bravura American troops and MacArthur’s frank, oddly phrased questioning, the Emperor’s inner confusion as to his status with himself and with Japan as a nation becomes more and more palpable. Small moments, for example where he rejects MacArthur’s offer to smoke a Cuban cigar, but then requests one a minute later after a question from the General throws him, subtly emphasize a person trained since birth to obscure himself behind his national image finally here and there breaking through the mask. This theme is never more obvious than a scene during the Emperor’s personal hobby time of studying marine biology, when his awed absorption with a hermit crab specimen turns his scientific dictations inward and he moves from the restriction of the crab to shallow water to Japan’s national shame at an anti-immigration law in California to the causes of the Pacific War. The scene is capped with a moment totally evocative of Sokurov’s dramatic technique emphasizing the revelations to be found in the minutia of banal behavior, where the chamberlain leads the absorbed Emperor back from the lab to his apartments, but Hirohito, momentarily absent-minded, takes a wrong turn in the underground bunker, hits a dead-end, and stands there stunned not knowing what to do now. The embarrassed valet retreats and redirects the Emperor, and for a second we got to see a confused human reaching out from under layer upon layer of ritual, upbringing, and training. Sokurov shot The Sun himself, and if the critics who bizarrely though Eastwood’s Million Dollar Baby had myopically dim photography saw this film they would probably think that the projector bulb had burnt out. In some respects this aesthetic choice works, especially in the way the dullness of the visuals seems to dreamily imply a miasma or haze coating everything in wartime Japan that is not the Emperor himself. On the other hand, the repression of vision, like in Meloch often eliminates a degree of environmental realism—would such a revered figure really exist in such austere (and Western) surroundings? Still, all the minimalism of the interior scenes pays off for the few moments Hirohito steps outside and we see the true haze: the smoke cloaked wasteland that is firebombed Tokyo. This revelation of “outside” Japan as just as claustrophobic as “inside” Japan (i.e. the closeted safety of the Emperor), though in a physical way rather than spiritual, adds a vital emotional resonance to the film, expressionistically saying just as much about Hirohito’s inner state through the visual excess as Ogata’s performance does through visual restraint. Restricting the sets to the plain, somber, and diminutive, the distant soundtrack dense with a mix of Wagner, traditional Japanese music, ambient war sounds, and Bach, and eliding almost any sense of narrative, Sokurov allows Ogata’s performance to speak through the smallest details of speech and physical motion the suppressed moral and spiritual confusion inside Hirohito that slowly but surely leads to a personal resolution of tremendous sacrifice. When the Emperor picks up and considers a photograph of Hitler meeting with Hindenburg perhaps he is struck by the physical, political split in the picture: on one side the Kaiser as an already dated symbol of emperor-as-the-state, and on the other the new kind of leader who used the German emperor’s (then “president”) image to grapple control of the country. For Japan such a demarcation of leadership impossible; though the Allies tried to brand Tojo as an equivalent to Hitler and Mussolini, the rise and fall of Japanese cabinets over the years and the lack of absolute power in Tojo’s position made the equivalency impossible. At the same time, MacArthur and the U.S. State Department thought they needed to keep Hirohito in place as (a human) Emperor to ensure the obedience of the Japanese people under occupation. So what Hirohito sees when looking at the picture of Hitler, whose relation to and responsibility for Germany’s war seems so clear cut and obvious, is the complete moral and spiritual bog that exists when trying to “blame” Japan for the Pacific War. Through this bog Hirohito wades with an uncertainty that eventually turns to an epiphany of decision—when the Emperor renounces his divinity to end the war and save the Japanese homeland—that is so played down in Sokurov’s somber film that it hardly seems like the triumph of sacrifice and self-understanding it is. Ultimately, The Sun’s power lies in its meticulously realized, thrillingly acted exploration of the density of ambiguity surrounding Hirohito’s identity as the Japanese emperor. Thank you, Erik, fascinating background.